By 1874 George and Emly had moved to to the London Suburb of Balham in Surrey. The couple moved into Bedford Lodge in Balham Hill. They aquired the Property after Mr Robert Sketchley's family had left. 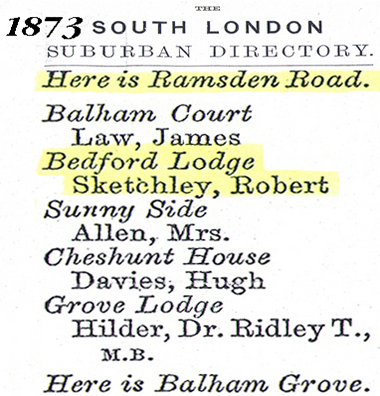 The Directory listing (left) is from 1873 just before the Musgrove's arrived. George and Emily's first son was born at Bedford Lodge in September 1874 but tragically died eleven days later. The death was reported by Margaret Bradford nee Aitchison who was George's aunt and had lived with him in St Pancras. The map below is of this period. Balham at this time was a very scenic and rural village and with the advent of the railways there was rapid redevelopement resulting in the Balham of the present day which bears no resemblance to this almost idyllic setting. 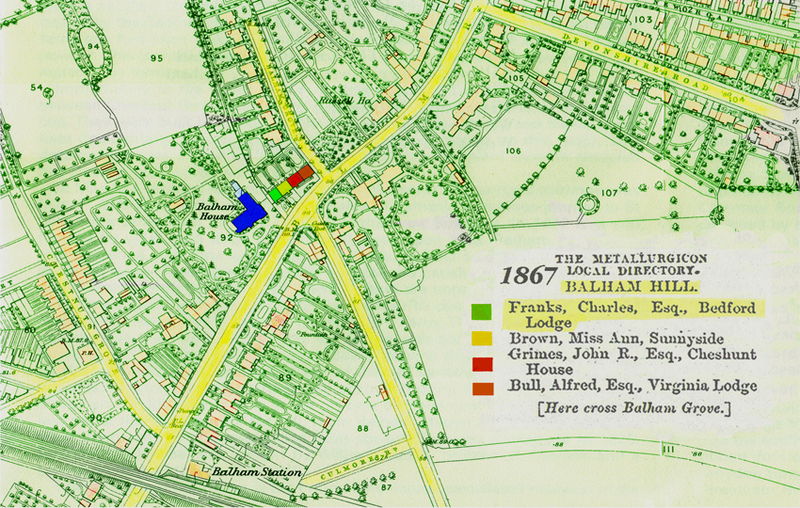 Bedford Lodge was located adjacent to Balham house coloured blue on the map. This was typical of the large houses and Villas that were prevalent at this time.